While there were many unforgettable gowns on the red carpet at the 2017 Golden Globe Awards, we couldn’t keep our eyes off of the accessories! The focal point for many of the outfits were necklaces, rings, and earrings! There were some classic, vintage jewels and a couple of trendy pieces, like chokers, made an appearance- proving that chokers aren’t out for 2017. Whoever said less is more clearly never knew how to layer rings! 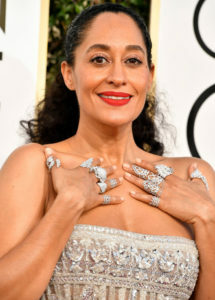 Tracee Ellis Ross stunned everyone with a fistful of diamond rings. Intricate layered rings were also featured on stars like Drew Barrymore, who wore 7 Harry Winston diamond rings. A great tip for achieving the perfect layered ring look is ordering a size down so you can have midi rings! Shop the layered ring trend here. 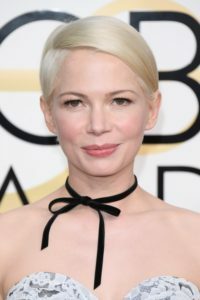 Michelle Williams proved that chokers are here to stay for 2017. She made edgy and elegant work with a lace Louis Vuitton gown and a simple, dainty black choker. Her look proved that one tiny accessory packs major punch. Chokers turn even the most basic outfits into style statements. Shop the trend here. Reese Witherspoon wore a dazzling canary diamond collar necklace by Tiffany & Co with her yellow gown. The right statement necklace, especially a glam one, can turn any plain outfit into something special. If you aren’t rocking Versace like Reese Witherspoon, try adding a glam statement collar necklace to a chambray shirt! Shop the trend here. Actress Priyanka Chopra wore a gorgeous statement pendant from Lorraine Schwartz. A statement pendant necklace is a great alternative to a collar necklace. For some, collar necklaces are too chunky, especially if you have a short neck. A statement pendant provides the same amount of wow-factor, but it takes up less space! Shop the trend here. Emily Ratajkowski rocked a pair of drop statement Reem Acra earrings on the red carpet. Paired with a faux bob, the earrings accented her yellow dress perfectly. Drop earrings add that extra punch to perfectly polished power outfits. They add attention-grabbing detail that is impossible to ignore- in a good way! Shop the trend here. The final item on our list of jewelry trends we loved from the golden globes is layered necklaces. Zazie Beetz layered two delicate gold necklaces that added just a little something to her all black gown. Simple, yet elegant, these necklaces make her outfit look complete. Shop the trend here. Overall, there were a lot of jewelry trends that we loved from the Golden Globes and we are inspired by all of the looks! This year’s set of stars dazzled us with jaw-dropping statement pendants and simple, dainty pieces that topped off the night’s best looks. Which look was your favorite? Tell us in the comments below!